V-Mar stickers are finally here. Stick 'em on your bike, your truck, your lunch box, even your mobile phone. Send us a self addressed stamped envelope and we will send you some for free. 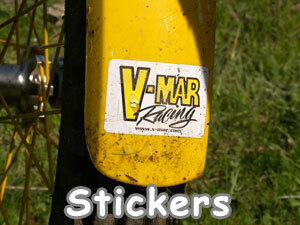 Or when you place an order for some V-Mar parts, just add a comment to your order asking for some stickers and we will toss some in the box for you. 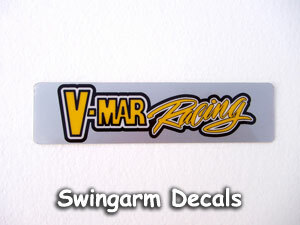 Hot off the presses are the new V-Mar swingarm stickers. These are the same 0.5mm thick heavy duty material as the factory swingarm stickers. They measure 37mm x 150mm (approx 1.5" x 6") to fit the swingarm of your trials bike.